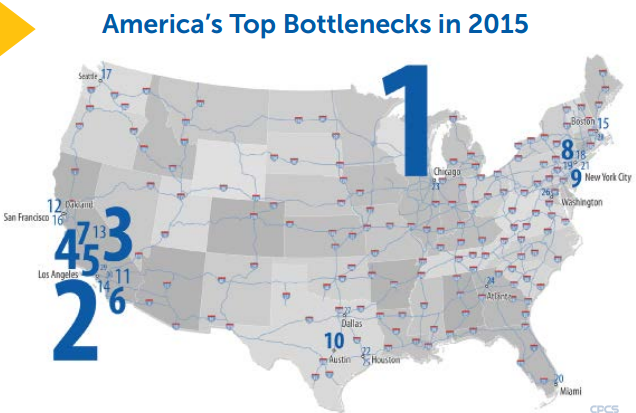 Unclogging America’s Arteries 2015 utilizes vehicle speed data to identify the 50 worst highway bottlenecks across the nation, highlighting the benefits of improving the top 30. Our nation’s top bottlenecks bring passenger and freight traffic to a crawl on key Interstate and freeway facilities every day, across the country, and negatively affect U.S. economic competitiveness, the environment, and quality of life. For drivers of personal and commercial vehicles in affected regions these bottlenecks are very real and the impacts of constant and crushing delays have significant implications on their productivity and health.